Creative Technology has recently announced a couple of solutions from their Sound Blaster range – the PCI Express Sound Blaster X-Fi Titanium Fatal1ty Professional Series and PCI Express Sound Blaster X-Fi Titanium Fatal1ty Champion Series sound cards, while will take full advantage of PCI Express-based PCs by unleashing the full power of Creative X-Fi hardware audio processing. These new PCI Express Creative sound cards each boast a striking design that oozes with “high performance” at a glance. The best professional PC gamers in the world who are taking part in the Championship Gaming Series (CGS) will be equipped with these new PCI Express Sound Blaster X-Fi Titanium Fatal1ty Professional Series. Priced at US$149.99, the PCI Express Sound Blaster X-Fi Titanium Fatal1ty Professional Series features Dolby Digital encoding, for single-cable connection to home theater systems. The card leverages the power of the X-Fi processor optimized for PCI Express to deliver accelerated audio for improved game performance, with ultra-realistic EAX 5.0 effects and 3D positional audio. Hardware-powered 3D positional audio and EAX 5.0 effects provide stunning positional audio realism over headphones and speakers, for a much more immersive gaming experience than any motherboard audio solution can offer. The Sound Blaster X-Fi Titanium Fatal1ty Professional Series also vastly improves voice chat clarity in online games where collaboration is vital. 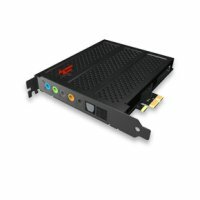 Priced at US$199.99, the new PCI Express Sound Blaster X-Fi Titanium Fatal1ty Champion Series sound card includes all of the features of the PCI Express Sound Blaster X-Fi Titanium Fatal1ty Professional Series, plus an internal I/O drive for quick front panel connection to headphones and headsets. This versatile internal I/O drive design offers the choice of placement in either a 3 1/2″ or 5 1/4″ drive bay. The 3 1/2″ drive features mic-in and headphone-out connections. This drive slides inside the 5 1/4″ drive, which adds RCA line-in connections. For ordinary gamers like yours truly, these are but luxury add-ons for the computer. I think I’ll give it a pass and settle for on-board sound instead.